We're back and we want to use our last thirty-three favorite things to shout out to some of our favorite local businesses in Chicago. They run the gambit from art to chiropractic to pet supplies. If we need to do something in Chicago (not food this time!) these are the people we typically support. Hello friends and readers! 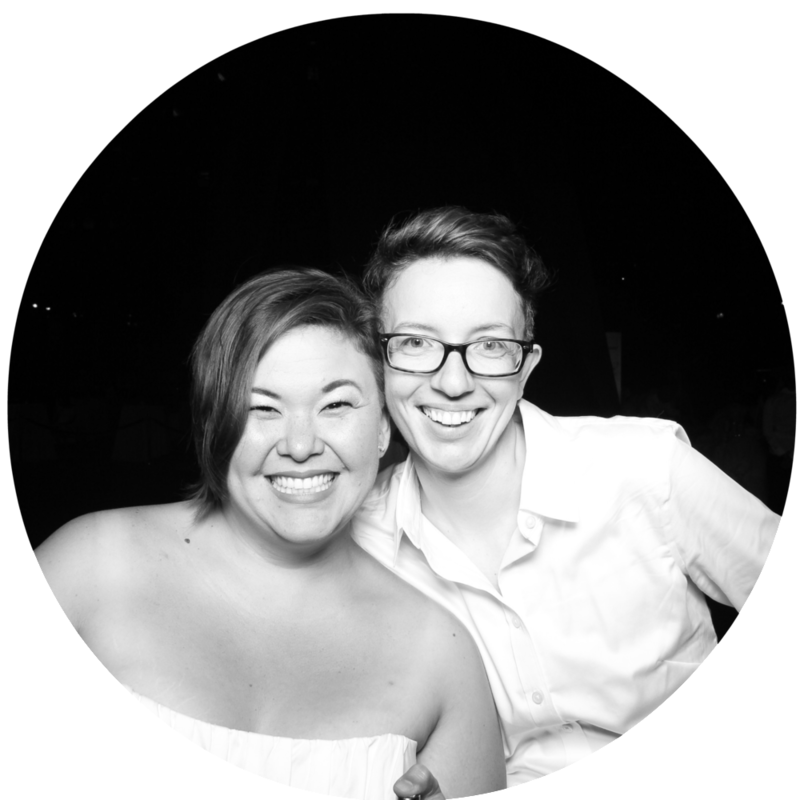 We have just entered the second year of this blog and another year of concentrated sustainable queerness! Last year, shortly after starting our blog, we provided you with an introductory post about why and how we live sustainably and call ourselves Sustainably Queer. We decided that as a means of looking back and celebrating our one year anniversary, it would be fun to revisit that post. Please find a revised and annotated version of "How We Do" below! Spoiler alert: there have been some pretty big changes! Note: This may go without saying, but new actions/changes are listed in bold, things we are no longer doing are crossed out, and notes are in green. Let us know in the comments if you have any questions. Making orange infused vinegar for cleaning - We decided that we don't mind the smell of vinegar enough to go through this process regularly, plus the one batch I made last year lasted almost an entire year. We may do this again, but it's not high on the list. Woodworking with reclaimed wood - We took one class from the Rebuilding Exchange, but we haven't continued woodworking. We still have three unfinished table tops chilling in the basement, so hopefully eventually they will become tables, but who knows when. Using rags instead of paper towels - We do this as much as possible, though we still haven't found a good substitute for paper towels for draining bacon (we're going to try some of these options soon). Giving away two items for every one item we bring into the house - This is still the rule, but we've been scaling way back on our buying, so sometimes we give away things even without buying something new. A larger purge is planned for early summer, so we can put stuff away without feeling cluttered about it. Switched to wind powered electricity (it’s cheaper too!) - Still going strong! Using homemade washable swiffer pads - Love these still! Recycling basically everything we can - We are planning a "How to Effectively Recycle in Chicago" post at some point, there are tricks to it. Leather-working with Chicago School of Shoemaking - You can check out our blog about the experience here. We're currently saving up to take Leatherwork 201, with the end goal being saving up enough to take the Beginning Shoemaking class because, really, what's more awesome and sustainable than being to make your own shoes?! Large-scale refrigerator/freezer organization - Things got real about a week ago when we bought some Fridge Binz. Yes, we try to avoid bringing more plastic into our home, but we also try to avoid wasting food. We weighed the pros and cons and decided to go with the plastic bins for now, with the idea of switching to bamboo or metal sometime in the future, if we find something that fits our needs. Using baking soda as shampoo - It took her years, but Kristl finally figured out a way to make this work for her hair. She's planning a post on it soon. Making homemade deodorant - Rachel uses this exclusively, Kristl's pits are more delicate, so she's still searching for a recipe that her skin can handle. Using Chinese medicine/natural healing home remedies instead of Western medicine cures - With the addition of epilepsy to her life, Rachel is now obligated to take a Western medication to control it, but otherwise, we are mostly reliant on acupuncture, chiropractic, and herbal medicine to keep us healthy. Meditation practice - We both really could stand to meditate more often and for longer, but it's still helpful even in small doses! Using eco-friendly, reusable menstrual products - We're planning a post about menstrual cups and cloth pads/liners in the next few months. Saving bacon fat and using it to cook other things (like sweet potatoes, yum!) - This isn't actually a new thing, we just forgot to include it on our initial list. Making staples for the week (baked/boiled eggs, congee, etc) - We still do this, though the staples themselves have changed. Recently, we've been making a lot of breakfast bars, and soups/stews that are good for eating over 3-4 days. Making bigger batches of the meals we create so we can freeze portions for when we aren't able to cook - This has saved us on many occasions! We can pull a container out of the freezer and have it for lunch or dinner instead of going out to eat or getting takeout. Infusing liquors (vanilla vodka and ginger vodka so far) - Rachel has infused vodka with all manner of things, including pineapple, blueberries and a specific spice blend to make it taste like gin. Making our own kombucha - So much cheaper than buying it! Making ricotta, yogurt, mustard, cheez-its, etc from scratch - Again, the actual things we're making from scratch has changed, but we are still committed to buying as few packaged/processed foods as possible. We bought an upright freezer - We can keep more meat and veggies in the house and put up fruit and veggies from the summer without messing with as much canning. We now have more versatility in how we "preserve" produce. Signing up for CSA and egg share - We've changed our approach on this since Rachel is in farm school this year. We will probably have some access to vegetables that we didn't have before and hopefully we will be able to grow more than we did last year. The egg share we had last season has been restructured to only be offered to CSA members, so we are no longer getting a carton of eggs a week. This is kind of a relief, as at one point last summer we had 4 dozen eggs in our fridge. Joined a meat and egg co-op - True Nature Foods has a relationship with a local, pastured farm where the consumer pays $60 a year for membership and is then able to order/purchase a wide variety of meat products and eggs for a reduced price. This makes eggs cheaper than our egg share and we only have to buy them when we need them. We are doing our best to only eat meat from local, pastured, humane farms. Choosing to eat at restaurants that serve sustainably sourced food - This is a huge consideration especially where meat is concerned. Every choice you make about where to spend your food dollars impacts how safely and sustainably food is produced, in general. Cheaper food is almost always cheap due to government subsidies or externalities (pollution, run-off, inhumane practices, lack of oversight, diminished workers' rights, etc), higher quality food is often more expensive because care was put into it's production and little harm was done to third parties (consumers, workers, animals). Not only do you vote with your money, you also farm with your money, by proxy. Homemade gifts - We didn't buy any Christmas presents in 2013. We either created or re-gifted everything we gave out or we didn't give gifts at all. It worked out perfectly. Using community garden plot and backyard to grow food - We just got clearance from our landlord to use some of our backyard space to grow more things. This is a very exciting development and we are still deciding how to make it functional and beautiful. Worm composting - Worms and composting took a little bit of a hiatus over the winter. They hung out in our basement because the "earthy" smell was a bit much for us in the apartment. The basement was cold, given our wily winter, but I have seen signs of life, so hopefully worm composting will be back in order soon. Bugeting via You Need A Budget (YNAB) - With Rachel quitting her full-time job and Kristl going through an office relocation, we knew 2014 was going to be a different picture financially. We took the pro-active approach and started zero-sum budgeting in December with a program called You Need A Budget. Things have been going very well so far. We have been able to save in advance for big bills (like car insurance) and put money away for upcoming big expenses (new car?). It's pretty awesome. They offer a free trial, so you have no reason to try it out for a bit. Full disclosure, if you sign up using the link above and subscribe after your trial ends, we'll both get one month free - it's a win-win! Kristl is moving her practice to a location with-in walking distance of our house - This exciting for all kinds of reasons, but primarily because she will not need to use the car! Well, that's about everything, it is a bit overwhelming, but we're managing ok on a day-to-day basis. As always, feel free to check out anything we link to and ask us more questions about the products/processes. We are always willing to write posts based on reader interest, so if there are specific topics you want to hear more about, please let us know in the comments below! Thank you for all your support! Here's to the success of year one, and plenty of sustainable queerness to fill year two and beyond. Hi friends! I got a lot of questions about my skincare routine, so here's a quick FAQ about the products and techniques I use. I have answered the questions to the best of my knowledge and ability. Disclaimer: I am not a dermatologist or scientist. I cannot and guarantee any specific results if you switch to this skincare routine. Q: What is Dr. Bronner's? A: Dr. Bronner's is a castille soap, which means it has a vegetable oil base. The soaps are made of water, saponified vegetable oils, tocopherol (vitamin E), citric acid (I believe this is to adjust the pH of the soap), and essential oils. The soaps are Fair Trade Certified, use certified organic ingredients, and don't test on animals. They don't use synthetic ingredients and the packaging is made from 100% post-consumer recycled material. All-in-all, it's an easily available soap that I feel totally comfortable purchasing. Q: What type of Dr. Bronner's do you use? A: I started using the Tea Tree Castille Soap because tea tree is antibacterial and incredibly helpful at controlling the bad bacteria that can perpetuate breakouts. I used a 1:1 dilution when I was having severe breakouts, but as my skin has regulated I've sometimes found it to be drying (especially in the winter). Now I dilute it 1:2 or 1:3 and find it less drying. If you don't have severe acne, I really like the Lavender Castille Soap as well. Lavender is great at calming and soothing the skin. I find that when I'm having a lot of redness the lavender helps to reduce it. When I finish up my current bottle of Tea Tree, I will be switching to their Baby Mild Castille Soap. We bought a gallon of Baby Mild to use in a variety of ways around the house and it just makes sense to streamline. Plus, because Baby Mild is unscented, I can add Tea Tree or Lavender essential oil on my own and mix up little batches depending on what my skin needs. I recommend starting with the 2 oz. bottle of whichever soap you want to try. The small bottle has a very small hole in the lid, small enough to only use one drop at a time. One drop is more than enough to wash your whole face. If you like it, then you can buy a larger bottle and dilute it. Plus, you'll have the small bottle to take with you when you travel! Q: Where can I buy Dr. Bronner's? A: As far as national stores go, the products are available at Target and Whole Foods. Health/Natural Food stores tend to stock them as well. You can also buy the products through their online store or find a store near you with their store locator. And, of course, they're available on Amazon, which I've used in the links above. Q: Why do you use the liquid instead of the bar soap? A: I've never actually tried the bar soap on my face. I started with the liquid because I liked the customizability of it. I've been able to use it as strong or diluted as I needed and therefore never saw the need to try the bar soap. A: Jojoba oil (pronounced "ho-ho-ba") isn't actually an oil, it is a wax ester. It's structure is very similar to that of skin sebum, so it integrates easily. When you use it as a moisturizer it actually absorbs into the skin, it doesn't sit on top of the skin like other oils do. It not only moisturizes, but also lets the skin breathe. It even helps break down clogged sebum that can contribute to acne! It also helps with skin elasticity and in reducing fine lines and wrinkles. It also is very shelf stable and unlikely to cause skin irritation. Q: Where can I buy jojoba oil? I really like the Certified Organic Jojoba Oil from Mountain Rose Herbs. As a company they strive to offer sustainable, organic products and I feel really good about supporting them. That being said, I realize that buying organic and sustainable is just not in the cards for some people and that's totally okay. 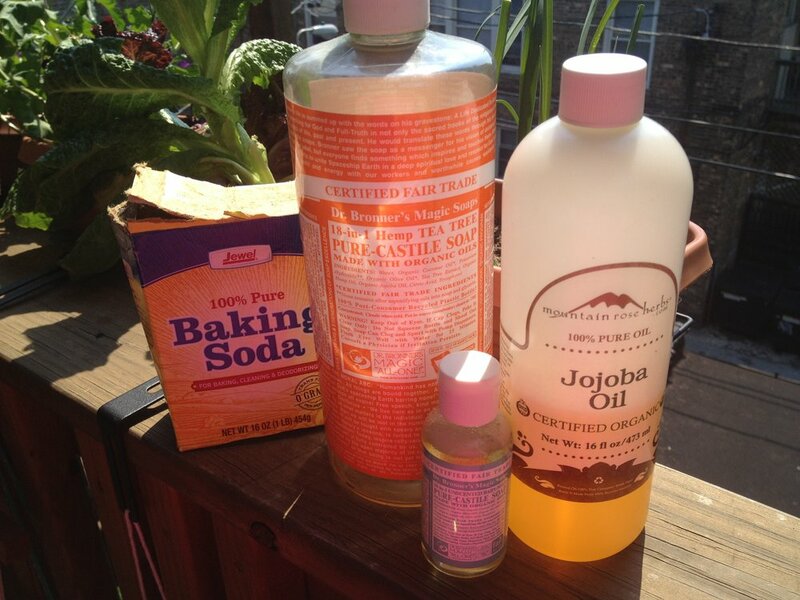 I've also used the 100% Pure Jojoba Oil from Trader Joe's, which is more affordable. You can also find it at Whole Foods, GNC, Walgreens, or Amazon. Q: What about _______ oil? A lot of you have asked about using other oils on your skin. Now, I haven't tried all of the other oil options on my skin, but the ones I have tried I haven't liked nearly as much as jojoba. I'm assuming this is because jojoba is not actually an oil (as mentioned above) and so it interacts differently with your skin. When I tried coconut oil (organic, virgin, unrefined) I found it to be drying. In my research I've found a number of people complaining of similar issues, but not good reason for it other than as an oil it sits on top of the skin instead of actually providing moisture, so if your skin is already dry it will trap that dryness. I know some people swear by coconut oil for their skin, so I think it just depends on the person. If you love coconut oil, but are confused about what kind to buy, this post at Food Renegade breaks it down pretty well. I tried castor oil for a while as well and found that it absolutely did not agree with my skin. My pores were clogged, my skin was excessively oily, and I broke out terribly. Castor oil is an extremely thick oil and I didn't find that it absorbed into my skin well at all. I've used olive oil in a pinch and also found it to be a little greasy. That being said, if I'm somewhere and I've forgotten my skin oil and the only options are a packaged skin cream or olive oil (or coconut oil or some other more natural oil - not canola or vegetable), I'll absolutely choose the oil 100% of the time. If you already use an oil on your skin and like the results and want to stick with it, please do. I actually now use a homemade blend of oils on my skin (a jojoba base with additional oils mixed in), which I'll get to in detail in a future post. Q: What is a toner? A: According to Wikipedia, a toner is a skincare item used to "cleanse the skin and shrink the appearance of pores." People with oily skin are frequently told to use an astringent toner to help dry up the oil. I've found this to actually be worse for my skin. The more you dry up the oil, the more oil your skin produces, the more oil there is to clog up the pores, so on and so forth. I used a toner diligently for years and finally phased out of it a few years back. I haven't missed it a bit and am happy to have one less packaged item to purchase for my skin care routine. Q: What is witch hazel? Witch hazel is an astringent and antioxidant, which means it can be helpful with acne. When I do use a toner/astringent, I use alcohol-free witch hazel. You have to be very careful reading labels, as a number of witch hazel products have alcohol, which is incredibly drying. I use Thayer's Lavender Witch Hazel because for a long time it was either that or Rose Petal as far as easily-available alcohol-free toners went, and I strongly dislike the smell of roses. Now it appears that Thayer's makes a Fragrance-Free Unscented Witch Hazel, which would be my choice should I need to purchase it again. Q: Where can I buy Thayer's Witch Hazel? A: I used to purchase it at Walgreens, but the Thayer's Store Locator isn't showing that as an option anymore. I think Target, Whole Foods, GNC, and other stores like that should carry it. You can also order it from their website or from Amazon. Q: Why should I exfoliate? A: This is another thing that skincare companies tell you is absolutely necessary for healthy skin. They want you to think that you should either manually or chemically exfoliate the dead skin cells from your face on a regular basis. Do I think exfoliation is helpful? Yes, in certain circumstances. When my pores were really clogged, exfoliation helped with that. I wouldn't recommend exfoliating if you have active, open breakouts. Exfoliating in that situation can be incredibly irritating to the skin. I exfoliate probably once every 4-6 weeks, unless I feel my skin is unusually clogged. I tend to exfoliate more if I've been wearing makeup or sunscreen, as I feel that those things tend to cause build-up and clogged pores. So, depending on what you put on your face on a daily basis, you may need more regular exfoliation. A: Really. Baking soda (sodium bicarbonate) is naturally-occurring and the powder is very fine, but hard. This makes it a great physical exfoliant. It's better than, say, an apric ot scrub because apricot pieces can have sharp edges that cause microscopic tears in the skin. Those tears can aid the spread of bacteria and breakouts. To exfoliate with baking soda, I usually just pour a little in my hand after washing my face, add a little water, rub it on my face, and then rinse it off. You can also use it anywhere else you may need exfoliating! Q: When you do wear makeup, what kind do you use? A: This is tough. I try to use as few chemicals on my skin as possible, but I also try to limit purchasing things I don't need or won't use all that often. That being said, I was a makeup collector back in the day. I have a traincase full of stuff from MAC and Sephora. Because I rarely (less than 10 times a year) wear makeup, I personally can't justify buying new, eco-friendly, sustainable, chemical-free makeup. When I wear makeup, I use a powdered mineral foundation that is free of bismuth oxychloride. If you wear or are looking into switching to a mineral foundation, watch out for bismuth oxychloride. It wrecked havoc on my skin and took almost two months to recover after one exposure. Edited (6/21) to add: The foundation I use is discontinued. I'd recommend Everyday Minerals. They have a cheap sample kit you can get to try a variety of products/colors before you order the regular size. If you want a pressed mineral foundation, I like Jane Iredale. When I need new foundation, I'll be ordering from Everyday Minerals. Q: How do you remove your makeup? A: Easy! I just take some jojoba oil and massage it into my face. It breaks down the makeup and makes it easy to wash off. If I'm wearing a lot of makeup, I'll massage the oil around my eye area and then wipe it off with a baby wipe and/or cotton swab. Q: What do you use for sun protection? A: I'm still searching for sun protection that I can happily suggest. At a friend's recommendation, Rachel and I started taking Astaxanthin (we like Nutrex Hawaii BioAstin) as a supplement. It is a strong antioxidant and studies have shown it helps reduce UVA damage internally. It has not been all that sunny in Chicago, but I can say that neither of us has gotten a sunburn, even on days in which the sun has made an appearance. As far as external sunscreen, I heartily recommend checking out the Environmental Working Group's Sunscreen Guide (they also have an app available, which is helpful if you're out shopping for sunscreen and need some info ASAP). We tried the Alba Botanical Natural Very Emollient Sunscreen, which rubbed in well and protected us from the sun, but has some questionable ingredients. We also tried the Badger Kids Sunscreen Cream which was incredibly chunky and difficult to rub in, but Rachel didn't get burnt (and she's pretty pale) and the ingredients are okay across the board. I think I'm more comfortable recommending the Badger, after studying the ingredients in both. Before applying, be sure to squeeze the tube thoroughly with the cap on to make sure the ingredients haven't separated. Both brands are available from Whole Foods and Amazon. Our end goal is to make our own sunscreen, so watch for a post on that sometime this summer (hopefully)! Q: What do you do when you breakout? How do you spot treat? A: Usually if I breakout the pimples are very small and inobtrusive. Occasionally, though, I will get a larger breakout on my jaw area (frequently hormone-related). When that happens, I spot treat with organic tea tree oil. That usually clears it up in a day or two. If I breakout in a larger area than usual, I either add a little tea tree oil to my jojoba oil before moisturizing or I use a topical Chinese herbal formula called Yin Care. Yin Care has many uses, but I really like it as a topical acne medicine because it's relatively gentle (meaning it won't burn or dry your skin), but very effective. To apply it, I get my hands wet (to help dilute the formula) and put a drop on my palm. I rub my hands together and then pat on to my skin and let it dry. My best advice is to listen to your skin. Pay attention to it. Is it feeling dry? Use a little extra jojoba. Does it feel clogged? Maybe it's time to exfoliate. As with any skincare routine change, your skin may get worse before it gets better. I recommend sticking with it for 4-6 weeks. If you have any questions, please don't hesitate to ask! This post contains affiliate links. If you purchase an item via an affiliate link, we may receive a small commission, but there will be no extra charge to you. This post has been a long time coming, because this is one of the things people ask me about most often. 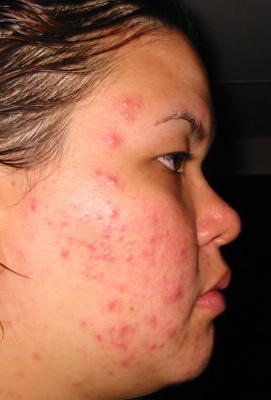 I will start by telling you my acne story, and then tell you about my personal acne solution. I started breaking out around the age of 9. NINE. I had terrible, red, painful cystic acne for all of my teenage years and into my early twenties. As a teenager I went to the dermatologist weekly to get liquid nitrogen blasted on my face in the hopes that it would clear up my acne. I also got the really big zits injected with steroids for a while, but the steroids had a really unsettling effect on me, so I discontinued that treatment pretty quickly. Basically I did every treatment recommended by my dermatologist, short of Accutane. In fact, I was on -cycline drugs for so long the roots of my teeth turned blue, something I didn’t discover until I had some teeth removed in my late teens. My oral surgeon asked if I’d been on tetracycline or monocycline for a while and when I asked why, he showed me my teeth and explained that prolonged use can turn the roots blue. That was kind of terrifying to me. It made me realize just how much the meds permeated my entire body - while not even having that great an effect on my skin! I stopped the internal medicines shortly thereafter and decided to really focus on my skincare routine. 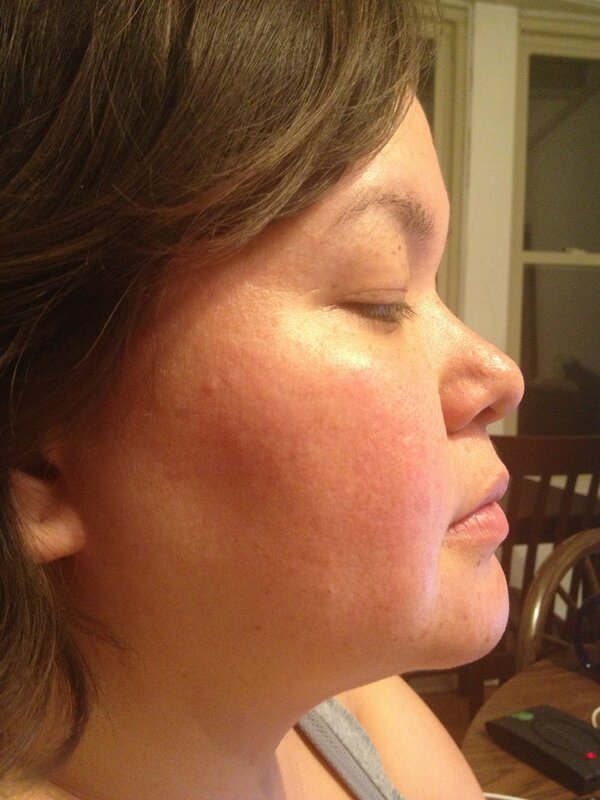 I started really simple with Cetaphil, but had an allergic reaction in which my skin burned and turned bright red. Cetaphil is a line of products which most doctors recommend as super hypoallergenic, mild, and gentle. This was not going to be easy. Like most teenagers (in Hawaii in the '90s, at least) I went full-blown with Clinique products. It worked for a bit, but then I started having a reaction similar to that I’d had with Cetaphil. So not only did I have incredibly painful cystic acne, I also had extremely sensitized skin. Looking back, I think it’s because of all the internal and external medications I had taken. My skin had no idea how to take care of itself. I went through a few more skincare lines with varying levels of success - Murad, ProActiv, Origins, Fresh, and others I can’t remember. I went to Boston for college, dropped out of college, started acupuncture school and, still, my acne was out of control. A year into acupuncture school a friend and I took a semester off to go to esthetician school. I figured THAT would be my ticket to beautiful skin. In esthetician school I learned the ins and outs of skin, skincare, and makeup and got facials and skin treatment pretty regularly. I also started using Dermalogica, because that’s what came in our kits for school. My skin got better for a while, but after a little while went right back to being bad again. I tried fancy organic skincare lines like Eminence and Dr. Hauschka only to have similar results. I moved to Chicago when I was 22 and decided to join my roommates on the South Beach diet. My acne cleared up with the decrease in carb intake, but as soon as I had even a little bit of sugar it came back with a vengeance. I had basically given up and resigned myself to a lifetime of terrible skin. I haven’t even mentioned all the makeup I wore during this time, trying to “cover up” my terrible skin, as if a layer of foundation could hide the bumpy landscape that was my face. Through the makeup forums online I read about oil cleansing and it sounded promising, so I tried that. No matter what ratio of oils I tried, my skin just felt clogged and dirty. I tried it for a few months, but was never able to get through the adjustment period. That was when I threw up my hands and went bare bones with my skin care. I gave up all skincare lines and went with my gut. I went through a few incarnations before settling on what I’ve been using for the past few years. Are you ready? You sure? Okay, here goes. I use Dr. Bronner’s Tea Tree Castille Soap (diluted, 1:3 Dr. Bronner’s to water - though I think I'm going to switch to Dr. Bronner's Baby Mild once I'm done with my current stash of Tea Tree) to wash and I use either organic jojoba oil (usually from Trader Joe's or Mountain Rose Herbs, though I've linked to one on Amazon if that's easier for y'all) or a homemade oil blend to moisturize. That’s it. Even more? I only wash my face once a day. If I’ve gotten really sweaty and/or dirty, I may use Thayers Natural alcohol-free witch hazel as a toner, but I find that I rarely do that anymore (though it is a quick way to clean your face if you’re hiking or camping!). If I feel the need to exfoliate, I use good old Arm & Hammer baking soda. Take a little in your hand, add water to make a paste, and gently scrub it on your skin. At one point during my “new” skincare routine I started working at Sephora. I got a lot of free product and decided to try some of their fancy skincare lines. Guess what? I reacted to every one. I either broke out or turned bright red or had a burning sensation on my skin. I went back to my simplified routine and my skin normalized within a couple of weeks. Now, this isn’t to say that I’m completely breakout-free. I do get the occasional zit, but usually it’s small and it goes away quickly. If I get an unusually stubborn zit, I will sometimes put a little tea tree oil on it. Even with occasional breakouts my skin is so much better than it used to be. Now, I rarely wear makeup (we’re talking probably less than 10 times a year) and am 100% comfortable going out in public with a bare face. In fact, I even get complimented on my skin! Listen, I’m not ever going to push my routine on anyone. I know how uncomfortable that is and how frustrating it is to be on the receiving end. I did, however, want to share what worked for me, after trying what seemed like EVERY SINGLE PRODUCT ON THE MARKET. Do what you will with the information. Everyone is different. The nice things about this “regimen” so to speak is that it is really simple, very inexpensive and it fits swimmingly with a sustainable lifestyle. Dr. Bronner’s products are organically produced and organic jojoba oil is not hard to find. The soap is diluted, which makes it last a super long time, and you are only washing once a day, which makes that purchase go even farther. Certainly, the health of your skin is affected not only by what you put on your skin, but also by how you eat and your stress level. As a matter of full disclosure, I do not smoke or drink alcohol or coffee and I eat a diet composed mostly of organic foods. I run my own acupuncture business, so I have a stressful day here and there, but on the whole, my job is pretty low stress. I also receive acupuncture regularly, which helps to clear out any things that might be waiting around to aid the production of pimples. Regardless, I have recommended this regimen to many of my patients, friends, and Rachel, and most have seen dramatic results. Rachel went from constant breakouts to only the occasional blemish. If you are fed up with what the beauty and healthcare industry has to offer in regards to skin care for acne, give this a try, and commit to it for at least four weeks. Let me know if you have any questions or comments. UPDATE 06.21.13: I've compiled a Skincare FAQ post to answer questions that y'all have been sending me. Check it out!